Ok, it wasn’t really dark. Or stormy. In fact, it was a bright, sunny August day. But dark and stormy would have at least given me an excuse for one of my most embarrassing moments. The trailer looked inviting enough. There was just one teeny, tiny problem . . .
On this particular day, one of the assistant coaches asked me if I would mind driving to his house and bringing him his can of Skoal. Keep in mind, that this was back before the PC world we live in now, where having tobacco on a football field or even on school premises was about as common as smoking and drinking on Mad Men. So he proceeds to give me directions. Now keep in mind, this ain’t a big town that we’re talking about. We’re talking a little over 2,000. It should be easy to find, right. And really it was. It was just up the street a little, turn left at the church, and there’s a white trailer almost right across from a daycare place. 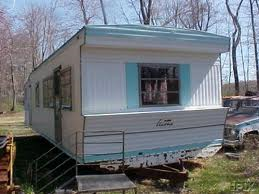 Only, I missed the part where he said he lived in the house NEXT to the trailer. So I go on my merry way, drive up to the trailer, and knock on the door. No answer. That wasn’t surprising, because he said his wife probably wouldn’t be home. So I turn the knob, still unsure if there’s anyone home. Nope, it’s empty. And unlocked. Again, it’s the life of a small town. In I go, like I own the place. Only, it looks a bit different than he described. A large cat makes his way over to check me out. He didn’t say anything about a cat, but if I had a cat, I probably wouldn’t tell anyone either. I make my way to the kitchen, and open the refrigerator, hoping there might be some leftover dessert that would make a great mid-morning snack. Nope, no snack. But surprisingly, there was no Skoal either. In fact, there was no tobacco products of any kind. Hmmmmm. This is strange, I think. Why would he send me after something that he doesn’t even have? Then I happen to notice the pictures on the refrigerator door. And who are these people, I think to myself. I don’t recognize anyone. EXCEPT one person – who happens to be the assistant manager at the local grocery store. And – oh wait! – isn’t this the assistant manager’s wife? I went back to the practice field empty-handed. When he asked me where his chew was, I told him I didn’t see it in the refrig. I figured it was better to be seen as incompetent, rather than just totally stupid. That’s my brief history as a criminal. It might not be the stuff of a made-for-TV movie, but it’s taught me a lesson or two over the years. And those lessons are . . . hmmmmmm. Well, I guess the lessons are that crime doesn’t pay. And neither does sending the wrong kid to your house to fetch your Skoal. Mark those down. Those are lessons to live by. Only the stuff that happened at the Rehab place in “the beautiful woodlands of gurdon” is completely classified. I’ll make no promises about any other events happening in or near the city limits.